Let´s try "Bottles". I can see bottles as still life, litter bottles or broken bottles. 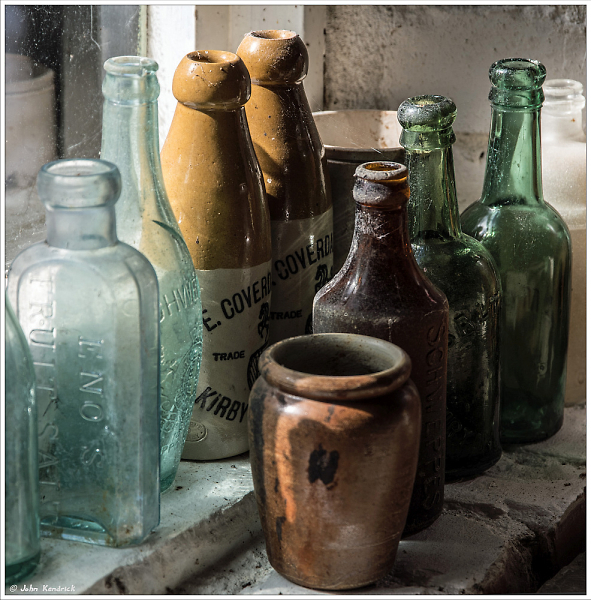 Old or New.The glass character and the shapes of bottles are the main subject. Sorry but my english is not good enough so this will be just a ranking. The others I´m not able to rank. And, sorry, in my opinion, a bottle is a bottle and a can is a can. Sorry that I marked it as a winner and then I was not able to change. Congratulations to the Winner. Happy New Year to all who took part. Thanks Lars, and Happy New Year... congratulations to John... thought it would be between that and Before by Nigel... the first three are goodly!! Having taken some photos of broken bottles inside a bottlebank... Nigel's picture needed a response. Happy New Year every one... may the shutter click just right, the exposures be just so.... and the buffer not overflow in 2019!! and you'll always get a thousand different takes!!" Thank you Larseric for the competition and judging - well done to you! Also to davidwozhere and NigelK who join me on the podium, whose both shots would be worthy as winners too. Well done to the rest for taking part I'm guessing its the time of year where people have other things on their mind that caused so few to participate. I'm sure I've seen some of those images before where the theme was similar, as indeed mine was! However it isn't the same shot that I entered before and I cropped this one based on the comment made regarding the other one. Entering the competitions does give one valuable feedback to take or ignore as one wishes. So now I have to come up with a theme for this week's competition... and a monthly one too. Ah well! My aim to come second backfired spectacularly in both! Doesn't happen often John. Congratulations on your double and to Nigel for his painstakingly lined up and lit collection of bottles. I hope everyone enjoyed emptying a few of them over the holiday. Thank you too Larseric for a great contest and for my 2nd placing. Congrats JAK, love the storyline in your image. nice bit of nostalgia too. And extended to Davidwozhere, NigelK, Johnruley, Dromfit and Smudge. Lovely challenge, and thanks are due to Larseric for tHe challenge and the judging exercise. HAPPY AND BLESSED 2019 TO YOU ALL!